By Sergei Dovlatov, translated by Katherine Dovlatov, Counterpoint Berkeley, @1983, translation@2013, 163 pages. So it’s like this. I started reading this book a few months ago and it didn’t reach me. I wasn’t feeling it. I was about 50 pages in and not tremendously impressed. I wasn’t hearing Sergei’s voice in my head like the books that were translated by Anne Friedman, and I started to think maybe it was the new translator’s fault, Katherine, Sergei’s daughter. Maybe, well maybe, she just wasn’t capturing his voice. This depressed me. So I was already a little depressed, and this didn’t help—and my Russian, while it is good enough to get me food, shelter and a bus ticket, is not good enough to allow me to read Dovlatov in the original, though this is sort of an emerging goal. Well, I was kind of giving myself a hard time about, well, was it Katherine’s translation, or maybe was it that I didn’t like Dovlatov as much as I thought? Was I possibly influenced by whomever it was who first gave me his name? Maybe my love of Dovlatov was a passing thing, you know, not real. 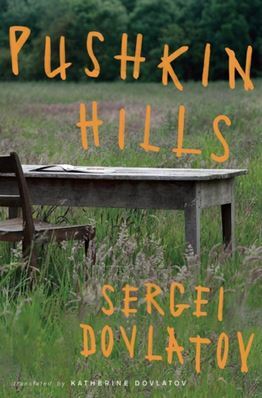 So I was just sitting around today, waiting for my rice to get done and not doing anything in particular but being stuck in the kitchen, and I picked up Pushkin Hills again. And there he was, Sergei, his voice, everything—and then he made me laugh—again and again and again. And I decided that I do really like him after all, and that Katherine did a fine job in translating him into English, and that it was just me. Just me being depressed and unreachable—before. I also liked the story about Stasik Pototsky, the man who decided to become a writer of literary best sellers after reading 12. 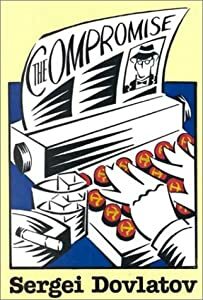 “A reliable armour of literary conventionality protected them from censorship.” And I started to think, hmmm, how far away is capitalism from communism? Things changed when Pototsky left the provinces and went to Leningrad: “A complete absence of talent did not pay, while its presence made people nervous….What was forgiven in a provencial novice affronted in a cosmopolitan writer.” Well, anyway, Stasik came to a bad end. And knowing Dovlatov’s difficulties getting published in the USSR, you get why. But best of all was this: “The more I got to know Pushkin, the less I felt like talking about him.” This is said by a Dovlatov’s character, as a tour guide at Pushkin Hills. And you get the significance of this if you understand how revered Pushkin is. And that’s when I knew. Yes, I do really like Sergei, and I’ve missed him. By Kurt Vonnegut, Jr, @ 1973, 295 pages. So while I was supposed to be reading War and Peace, I started reading Vonnegut. There’s this whole Vonnegut/Dovlatov connection I keep trying to make, but to read more Dovlatov, I either have to wait until April for the release of Pushkin Hills in English OR I have to learn Russian. Ok, so I know some Russian. I know enough to eat and travel. And to get some quizzical looks. Rosetta Stone, BTW, is turning out to be great for Russian pronunciation. Anyway, I read Breakfast of Champions a very long time ago. I’m reading it again because I remembered how intensely creative Vonnegut was with his structure and storytelling. On this read, Vonnegut pummels me over the head with foul language and imagery. Apparently, I used to be immune to this. Now, not so much. Breakfast of Champions—wow—what to say about this book. It is all over the place and perfectly organized at the same time. It has characters you don’t want to get to know, and yet, like the train wrecks they all are, you can’t stop reading about them. Hmm. 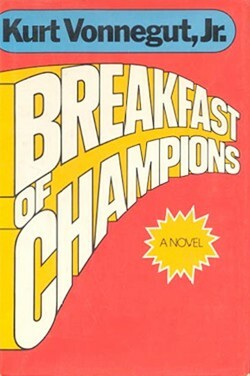 Breakfast of Champions is the kind of book that I think I want to read again, maybe in 20 years. Maybe then, I’ll be able to digest it fully. And Vonnegut, like Dovlatov, is one of those guys you wish was still around so you could say stuff like: hey, what do you think about the 2045 project? What do you think about immortality for humanity? Isn’t that a really bad idea? I’d love to put those guys in a room, ohh and add in George Carlin, who is also now in the club, introduce the topic, and let them go. What I wouldn’t give to hear that conversation. I wonder if D wouldn’t be too polite for these two rambunctious Americans. Would he sit there with a thin smile on his lips, thinking how uncivilized George and Kurt were? Or, would he, after almost coming to blows on certain subjects finally let loose with some raucous laughter, teeter on his chair, and nearly fall over? I have mentioned before that I reach for Dovlatov as I would for an aspirin. And since he is such an easy, interesting read, each time I buy one of his books, I finish it quickly. So, I started wondering today: what else is there? What’s left. Эпистолярный роман с Игорем Ефимовым, 2001. The Invisible Book (Невидимая книга) — Аnn Arbor: Ardis, 1977. Речь без повода… или Колонки редактора, 2006. Собрание сочинений в 4-х томах, 2004. Третий поворот налево (Белая серия), 2006. 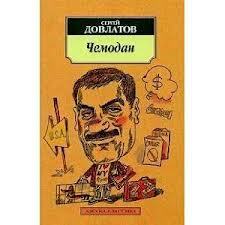 And, for a book I have not read but would like to, check out Dovlatov—My Dear Friend (2005) by L. Shtern. 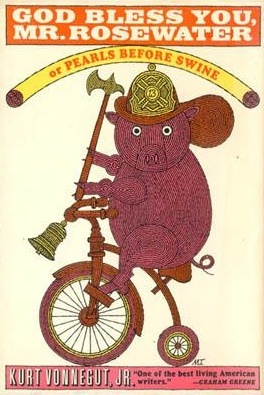 By Kurt Vonnegut, Jr. Delacorte Press @ 1965; 217 pages. The tumbler-and-soapsuds technique worked like this: A woman would look for a fly hanging upside down. She would then bring her tumbler of suds directly under the fly very slowly, taking advantage of the fact that an upside-down-fly, when approached by danger, will drop straight down two inches or more, in a free fall, before using his wings. Ideally, the fly would not sense danger until it [the tumbler] was directly below him, and he would obligingly drop into the suds to be caught, to work his way down through the bubbles, to drown. It’s still possible for an American to make a fortune on his own. Sure—provided somebody tells him when he’s young enough that there is a Money River, that there’s nothing fair about it, that he had damn well better forget about hard work and the merit system and honesty and all that crap, and get to where the river is. For me the story finally picks up with the tale of Fred Rosewater, the long lost relative of the Rosewater clan, who lives in poverty, not knowing that he is the heir to millions—the American dream. He learns of this, just as he is about to be caught in the embarrassing act of killing himself. 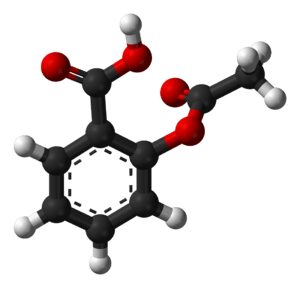 I wasn’t sure what Pearls Before Swine meant, but after researching the phrase, it seems to have particular significance. Food for thought anyway. By Sergei Dovlatov; Academy Chicago Publishers; @1990, first copyright Alfred A Knopf, Inc @1981; 148 pages. While reading about Kurt Vonnegut, I noticed this guy, Sergei Dovlatov. Apparently, Vonnegut said some nice things about Dovlatov, so that peaked my interest. The story unfolds as Dovlatov, a Russian living in Estonia, takes a job writing satire for the newspaper, On Watch for the Motherland. Turns out he isn’t a party member—which I found odd; I thought you would have to be a party member to write for a Soviet newspaper and that basically everyone was a party member anyway, but apparently not. Also, his articles weren’t satirical. Hmm, or were they? Each chapter opens with a short newspaper article that Sergei has written—and that must be written in a certain way or changed to satisfy his bosses—a compromise. Basically, the typical writer’s life. But in this case, it is a writer’s life under Soviet rule. And it seems, every aspect of Dovlatov’s life. One amusing anecdote is about an article that is needed for Tallinn‘s liberation anniversary. Dovlatov is given the assignment to tell the story of the 400 thousandth inhabitant born to the city. This number isn’t accurate, or even close, but no matter; it makes for a good story. Dovlatov goes to the maternity ward of the hospital in Tallinn and waits for a male child to be born. The 400 thousandth child needs to be a boy because a boy is more symbolic for the occasion. Dovlatov waits. The first child born that day is a boy, but he doesn’t meet all of the publicizable requirements; he is half Ethiopian. Then another boy is born—also unacceptable; he is Jewish. Dovlatov has to explain to the father that the paper is looking for a boy from a “worker-peasant family.” No intellectuals. Too bad, because the father has already written a poem for the occasion. A suitable boy is finally born, but now the newspaper, still seeking to tell a good story, wants Dovlatov to convince the father to name the child Lembit, a name out of Estonian folklore. They are willing to pay him. So for 25 rubles, a would-be Volodya becomes a Lembit. Sergei Dovlatov is immediately engaging. He captures my attention by talking directly to me; I find out who he is as he’s telling the story and I feel sympathetic to him (I have to think more about why). I like his tongue-in-cheek style. He’s absurd, honest, and subtlely humorous. I liked several of his lines, but especially this one: “Lying without hope of gain is not lying, it’s poetry.” Seems right, considering how much poetry pays. So probably, there are some things I missed, references, etc. that I didn’t understand because I haven’t ever lived in the Soviet Union. But, overall, The Compromise, was a good read and makes the interesting distinction between the facts and the truth. I found myself giggling through the last two compromises, high praise indeed. By Andrey Kurkov; The Harvill Press, London; @ 1996; 228 pages. When the Kiev zoo gave its smaller animals away because it could no longer afford to feed them, Victor, a struggling writer, adopted a depressed penguin named Misha. The story unfolds with Victor and Misha living together in an apartment in Kiev. For both of them, it’s a rather unnatural environment. This book did a great job of grabbing my attention early on. Page one and I was into the story. Kurkov subtly examines the nature of choice. There is a tension that develops and a contrast that is set up when the main characters have different kinds of situations to deal with: ones they have freely chosen for themselves and ones they have happened into. I enjoyed the way Misha’s predicament mirrored Victor’s internal struggle. I also appreciated that Misha wasn’t turned into a cheesy kid’s character. Misha was always his own penguin. Enigmatic at times, but after all, he was a penguin. I found Death and the Penguin to be very entertaining. And it ended exactly the way I wanted it to. One question remained for Andrey Kurkov. On the last page, the last line is the date range: December 1995–February 1996. What is this? The time it took to write the book? Bragging? There was something that happened to me while reading this book. Misha the Penguin had a health problem. The resolution to this health problem, when I read it, was like flipping a switch for me. I can’t explain it. I don’t really understand it, but it’s as though a weight was lifted. The shock. The laughter. The immediate understanding. It was all very personal. I’m not promising a cathartic experience for anyone who reads it, but for me, it helped. Sometimes the stars align with literature and this was the case for me. Death and the Penguin is a quick, fun read.